I was wondering how many of the old blue street signs are left around leeds the ones with white writing. I only ever saw one until yesterday then i saw another 2 albeit on on each side of the same building (but different adresses) I would love to know if there are anymore around leeds. Oh yeah the ones i know about are highbury terrace and highbury .... something cant remember and westbourne ....?? its off rowland road though ill post the links on street view when i ca access it. There are some in Chapel Allerton also at the back in the Hawthorne's I think. This one at Cross Flatts park. ...And just off Dewsbury Rd. These blue signs are probably Vitreous Enamel, glass powder fused on to the metal backing. All done at red heat. There is one of them old signs, I think its a cast iron one, that has a pointing hand on Oakfield Terrace just off Broadgate Lane in Horsforth. The sign says 'Back Road'. I wonder how many of these still remain? 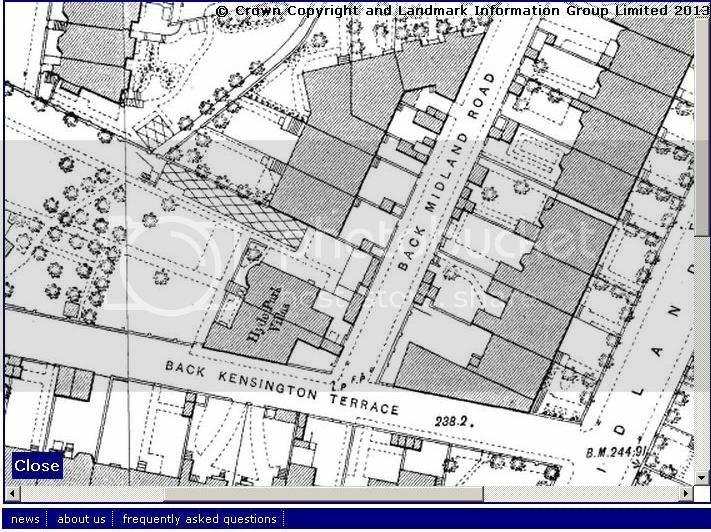 The only map I could find that referred to the building as Hyde Park Villas was dated 1890. Does anyone know how old these blue signs are?